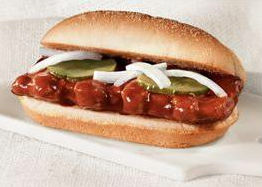 Pork, pickles, barbecue sauce and a bun: it’s the McRib! And it’s back! Robin Monica Alexander analyzes its mysterious appeal in the latest Random Play. It’s an exciting time of year. Leaves are falling and soon it will be time to put on the scarves and mittens. “Christmas creep” means that door-buster sales on toys, clothes and space-age TV sets will be offered the minute that the Halloween decorations are put away. Time to start planning the Thanksgiving menu, booking your holiday travel, and stuffing your face with delicious ground pork, onions, pickles and barbecue sauce … because the McRib is back, baby! Despite several “Farewell Tours,” it abides. Since being pulled from the regular menu back in the ’80s, it has been spotted in certain anointed areas of the country on and off over the years. But this time, it’s being offered nationwide for the first time in nearly two decades! The official return date was announced as November 2—Election Day. How fitting: you can exercise your rights as a citizen, and then celebrate the miracle of democracy by eating the sandwich that, despite its failure to rally the same kind of support enjoyed by hamburgers and chicken patties, is periodically brought back into the public sphere thanks to the devotion of a small but passionate constituency. My day was set: go to work, go to the polls, go to town on a McRib value meal as a reward for holding up my end of the American bargain. But the Mickey D’s near my place of work decided to go rogue and start serving McRibs a week early. I am happy to report that it was every bit as awesome as I remembered it being. No letdown here. And hey, there’s no reason I can’t eat another one on Election Day as I originally planned. After all, I gotta get my jollies while I can: the sandwich is only being offered until mid-December. Pulling it right before Christmas? Bah, humbug! Now, I know pigs are intelligent animals. I also know they taste amazing. Occasionally, when I’m about to drown my sorrows in some pork chops, I think of Babe and feel sad. But pork isn’t just something I enjoy; it’s practically in my DNA. My mother grew up in the South, where vegetables don’t taste right unless they’re flavored with pork. Crispy fried pork rinds were a normal snack at my grandma’s house, and my great-uncles, who grew up on a farm with hogs, still expect to have “trotters” (pig feet) on the table at Thanksgiving. When she was pregnant with me, my mom went to visit her parents and developed a forceful craving for Smithfield ham, a food so salty it might as well be called “Smithfield salt with some ham mixed in.” Her father went out and bought two hams, one to prepare for her immediately, the other to pack in dry ice to bring back to New York. When Mom went for her next doctor’s appointment, her obstetrician found that her blood pressure was alarmingly high and forbade her to eat any more of that demon ham. But by that point it was too late: I, too, am the kind of person who could sit next to a salty country ham, slicing bite-sized pieces off of it for an hour or so, and call that dinner. To put it mildly, I am not halal. You might think that someone with such a deep respect for swine-based cuisine would be contemptuous of a mass-produced item like the McRib. But pork is a versatile meat, and it can stand being pounded, minced and molded to within an inch of its life. Indeed, the McRib contains all the best elements of pork—its flavor and succulence—and none of the bad ones: bones, gristle, trichinosis. Other chains, including Subway (so much for “Eat fresh”), make similar products, but McDonald’s is still the champ when it comes to food processing; they’re using all the same ingredients as everyone else, but it’s like they’re performing alchemy and all the rest are just doing parlor tricks. So this fall, America, cast your votes, hit the stores, and eat a McRib. In honor of the pilgrims, it’s the least you can do. And I hear Germany’s gorgeous in January.